Reading this article I felt like someone had stolen my feeling and plastered them all over town. 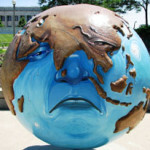 Many, many people are now suffering with negative emotions due to the fact that though we are not profession climate scientists we, nonetheless, grasp what’s happening and why. The frustration, grief and anger that follows is gnawing at our souls as a dog might chew on a tasty bone. I’m not a religious man but sometimes I can’t help but think to myself, “Goddamn the powerful deniers, who are holding back change, to hell”. Thank you for this brilliant article. It is long past time to slay the misinformation monsters and invite out the authentic and human voices of the scientists who have been so abused in this horrific suicidal chapter of Humanity. It is very clear to me that the issues and methods of coping you describe in this article are the only sane way to be facing our obvious and eminent fate. Great stuff, a bit too much hopium for my liking but interesting non the less. For any scientist to admit that they have any emotion about anything is a huge accomplishment. Losing our hopium is a process, so I can only imagine that some of these guys who sound hopeful won’t be sounding that way in another year or so. And losing hopium should be scientifically validated, and if it is conspiracy theory that holds back the truth, it’s tough to make that judgment call to believe a few who reprort the worst than the many who say we can still have realistic hope. Though, I often find the argument occurs in black and white terms…we have plenty to grieve and be outraged about whether we survive another millenium or 25 years. In a way, the polarization of the argument is a form of denial, as black and white thinking most often is. We should acknowledge what is now, what is before us, without letting projections get us too crazy down or up, unless they are pervasively upheld by the majority of scientists…imo. OK… so I agree with all of the above, mostly. However, what is lost in all of this is that we are at a VERY SPECIAL MOMENT in the history of our species… Science has opened up a zillion doors (I know, it is my passion as much as following climate science), people ARE waking up at ALL levels and there are NUMEROUS pathways, such as Mark Jacobson’s Solutions Project, Deep permaculture, and… oh I could go on for awhile… Point being? If you really want your ideas to get lost, read my 2014 book written with Guy McPherson, Extinction Dialogs: How To Live With Death In Mind. We have withdrawn from hopium.